Welcome to Dogs Mountain Philippines – a very special Dog Rescue Sanctuary. Dogs Mountain lies in north Luzon, Philippines. An Animal Sanctuary for hundreds of Rescued Dogs who share their Mountain land with a wonderful variety of Wildlife and other Animals . This Heart warming venture is all due to one special little rescue Dog called Woody. Dogs Mountain gives a ray of hope to Dogs in the Philippines. Visit Dogs Mountain! 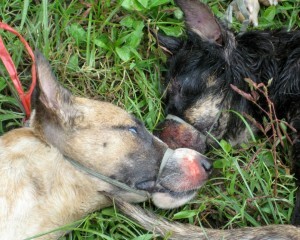 Half a million dogs are slaughtered annually in the Philippines. The Philippine dog meat trade is primarily centered in the city of Baguio, in the northern Luzon Island province of Benguet. Historically, it was associated with celebratory events and rituals of mourning and only affected a small number of dogs. However, over the past 25 years, the dog meat trade has rapidly increased for commercial rather than cultural reasons. Investigators have documented the existence of at least 25 dog meat restaurants and four slaughterhouses in Baguio, seven dog meat traders in Laguna and Batangas, and two slaughterhouses in Pangasinan. Unfortunately, there are many more underground entities involved in the industry throughout the Northern provinces. Stray dogs are rounded up off the street and shipped up to six hours to the Benguet province in extremely inhumane conditions without food or water. Steel cans are forced onto their noses and their legs are tied behind their backs. Many of the dogs are people’s pets—some are still wearing collars around their necks. Due to the stressful transportation methods, nearly half the dogs die before they reach their final destination. Sometimes 90 percent of the dogs die. Mortality rates are of no concern to the dog meat traders because the dead animals are processed along with the live ones. Behind closed doors, dogs are clubbed, their throats are cut, their fur is scorched off with a blow-torch, and their bodies are dismembered. A regional director of the Philippines National Meat Inspection Commission publicly stated that dog meat is not inspected by the Commission, and further called the consumption of dog meat “dangerous.”1 Consuming such meat puts individuals at risk of infection from such deadly parasites as E. Coli 107 and salmonella (commonly found in contaminated meats), as well as at risk of contracting other serious and potentially deadly bacterial diseases such as anthrax, brucellosis, hepatitis, and leptospirosis. Dog meat is additionally linked to the spread of rabies, a disease that kills approximately 10,000 dogs and 300 people per year in the Philippines. Evidence shows that rabies is present and potentially transmitted throughout all stages of the dog meat industry—sourcing, trading, slaughtering, and consumption—impeding efforts towards eradicating rabies in the region. The World Health Organization promotes mass dog vaccination campaigns and “controlling trade in and movement of dogs” as key components for dog rabies control and eventual elimination. The Philippines has an objective of eliminating rabies by 2020, a target that cannot be achieved unless the dog meat trade is eradicated—a fact that lawmakers understood when they included a prohibition in the trade of dog meat in the 2007 Rabies Act. The killing and selling of dogs for food was banned in the capital city of Manila in 1982. A similar ban was enacted nationally in 1998, with the Animal Welfare Act (Republic Act No. 8485). The Act prohibits killing dogs for food, with minimum penalties set at 1,000 pesos (equivalent to about $US22 at the time) and not less than six months in prison. The Anti-Rabies Act (RA 9482), passed in 2007, includes more severe penalties, with minimum fines of 5,000 pesos per dog and not less than one year of imprisonment for trading in dogs for meat. Despite the sanctions encoded in the law, however, law enforcement officials do little to stop this illegal trade. The Philippine government has expressed a greater commitment of late to eradicating the dog meat trade. The Wildlife Division of the Philippines’ National Bureau of Investigation (similar to the FBI in the United States) recently raided nine restaurants. The international non-profit Network for Animals (NFA), working in cooperation with local authorities, raided a slaughterhouse in Malasiqui, Pangasinan on December 5, 2012. Seven dog meat traders were arrested, 22 dogs were rescued, and 49 dog carcasses were confiscated. The local police, however, only got involved because NFA did the surveillance, provided the funding, and managed the raid. The police need to enforce the laws under their own initiative on a regular, widespread basis. The illegal dog meat industry in the Philippines results in the physical and mental suffering of hundreds of thousands of dogs each year and comes at a significant cost to human health and potential damage to the Philippines’ reputation. In order to successfully ban the trade in dogs for human consumption, mechanisms to enforce the national law should be established at the provincial, municipal, and village level in key areas where the dog meat industry continues to thrive. It is crucial to work with local communities to raise awareness of the risks the dog meat industry poses to both human health and animal welfare, and for local law enforcers to be equipped with the skills, knowledge and motivation to enforce existing laws. Our objective is to get the Department of Interior and Local Government to ensure that local governments and police in the dog meat regions consistently and aggressively enforce the national law, and make a serious effort to close down all dog meat operations.